You and your pooch will love these dog-friendly hikes, swim spots, restaurants and, yes, leash-free parks. 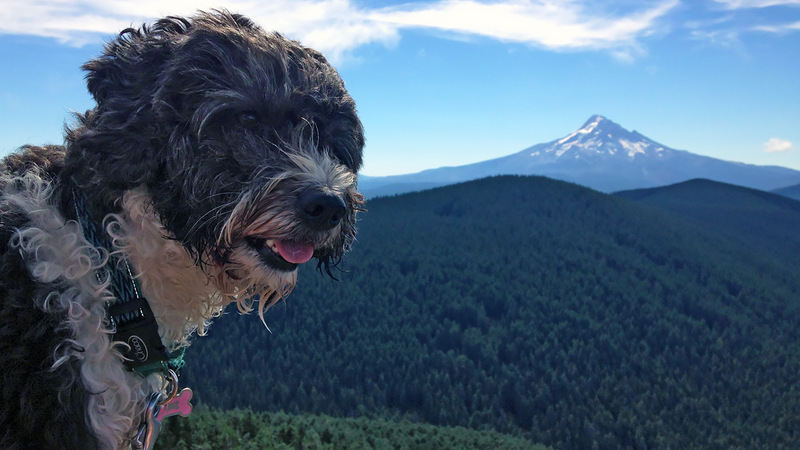 If your four-legged friend is your favorite adventure sidekick, spring and summer are the seasons to explore Oregon together. The days get gloriously long and sunny. 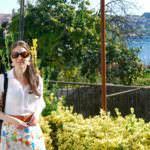 And the water — rivers, ocean and lakes — is prime for sun-basking, splashing and swimming. Ready to go? Don’t miss these top spots to roam, fetch, sit and play in the sunny weather. 1. In Troutdale you’ll find one of Oregon’s most beloved multi-sport areas, the Sandy River Delta, a network of trails that welcomes hikers, cyclists, horseback riders and four-legged friends. Locals call it Thousand Acres, an apt nickname for its 1,400 acres of wooded trails, open meadows, and off-leash access along the Sandy and Columbia rivers. It’s a favorite spot for swimming, fetching and exuberant tail wagging. Since summer is the busiest season here, keep in mind that the parking lot can quickly fill up; aim to visit early or midweek with your buddy and come with a back-up plan. 2. 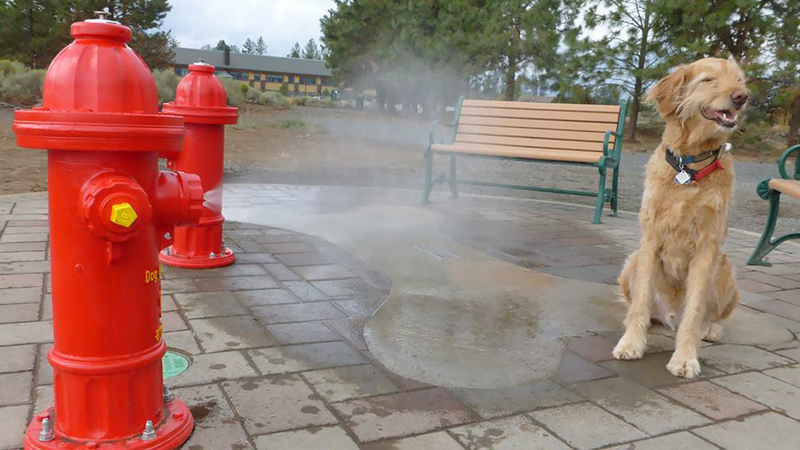 Get your pet set for off-road adventures in Bend, a sporty high-desert town that’s also known as DogTown USA. With more than 51 miles of urban trails and a dozen-plus off-leash areas in city parks and National Forests, this pet-friendly oasis is a wonderland for your canine friend. Check out Rimrock Trail, also known as Good Dog Trail, for expansive off-leash hiking through junipers, sagebrush and towering ponderosa pine trees. For more dog-friendly hikes in the Bend area, visit DogPAC.org, which can help you sniff out off-leash trails by season. 3. While it’s not technically a “dog park,” you can’t beat the Oregon Coast for exhilarating, off-leash freedom. In the U.S., where most of the shoreline is privately owned, Oregon’s 363-mile stretch of pristine beaches, rocky headlands and coastal forests are open to all. 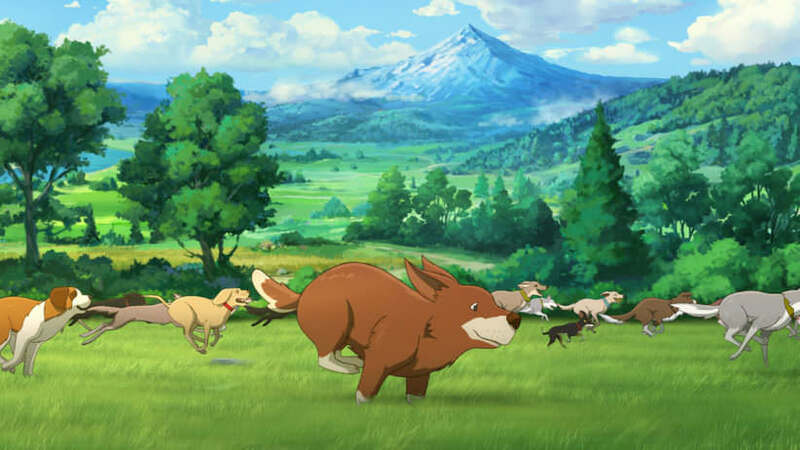 And we all know that beaches equal paradise for humanity’s best friend. There are a few exceptions where your dog will need a leash, or may not be allowed on the beach during certain seasons to protect wildlife and the sensitive intertidal areas designated as Marine Gardens. 4. Cruise through the verdant Willamette Valley to Minto-Brown Island Park near downtown Salem, the state capital. A popular spot for hikers, cyclists, and runners, this 1,200-acre park has idyllic trails winding through ash, alder and cottonwood groves, plus a 30-acre off-leash area devoted to dogs. For garden enthusiasts, check out The Oregon Garden in nearby Silverton, 80-acres highlighting the diverse botanical wonders that thrive in the valley’s temperate climate. The Oregon Garden loves to welcome leashed dogs; it even has the small Pet Friendly Garden, which exists to educate folks about pet-friendly and -unfriendly plants. 5. You might guess that Tin Shed in Portland loves dogs just from looking at their brunch menu (which includes dishes called the Fetch, the Roll Over, the Good Dog and the Stay). The beloved Northeast Alberta Street cafealso welcomes dogs on the patio and has a pooch-specific menu. On Tuesday nights, your pet can enjoy a free item from the dog menu for each human-friendly dish you order. 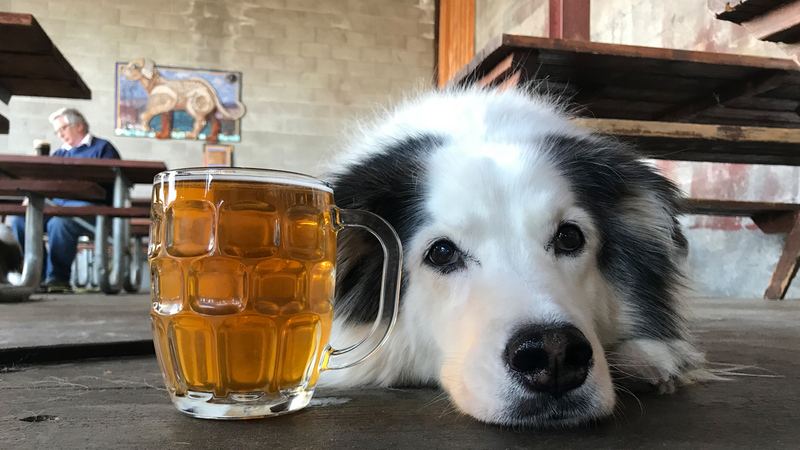 For happy hour, head to Lucky Labrador, one of Portland’s oldest dog-friendly brewpubs with multiple locations and host of the annual Dogtoberfest, a fundraising event and the city’s largest dog wash.
6. After cruising through the Columbia River Gorge National Scenic Area, soak up the sunnyviews with a wood-fired pie at Solstice Wood Fire Pizza. The pet-friendly patio is adjacent to the waterfront in Hood Riverand has prime outdoor seating. After a bite, head across the street to watchkiteboarders, windsurfers and sailboats crisscross the Columbia River. Bonus: ample hiking and walking trails nearby. Stay the night at Hood River Hotel, canine-friendly, vintage lodging with cityscape and Columbia River views. 7. After a day of hiking, swimming and mountain biking around Bend, most pets and their humans kickback at one of the local breweries, where dogs are welcome to dine alfresco. Try the patio and a pint at 10 Barrel Brewing Co., Cascade Lakes Brewing Company, GoodLife Brewing Company and Crux Fermentation Project, to name only a few. Really, you can’t go wrong. 8. Yes, you can take your dog wine tasting in the Willamette Valley. Taste pinot with your pup on the patio at Keeler Estate Vineyard in Amity, Roots Wine Co. in Yamhill, or Sokol Blosser Winery in Dayton to name a few. Then savor farm-to-table fare alfresco at wine country destinations like The Dundee Bistro, Golden Valley Brewery & Restaurant, or La Rambla Restaurant & Bar. Glamp the night away with Fido at The Vintages Trailer Resort, which has a cluster of retro-luxe Airstreams set on 14 acres. Pro tip: You can search for dog-friendly tasting rooms all over the state at OregonWine.org. 9. Explore the Cascade-Siskiyou National Monument on the popular Grizzly Peak Trail in Southern Oregon. The 5.4-mile loop peaks at 5,922-feet, with panoramic views of the Cascade Range and the town of Ashland. In early summer, wildflower meadows pop with lupine, columbine and paintbrush, providing the perfect photo backdrop for you and your pup. 10. Climb to spectacular views in the Mt. Hood National Forest on the Chinidere Mountain Trail. The 4.5-mile round-trip hike winds by wildflower meadows, lake vistas and magnificent views of Mt. Hood. On clear days, you can spy five glaciated volcanoes from the summit. Bonus: At the end, take a dip in the emerald-green Wahtum Lake to cool off. 11. Trek into Eastern Oregon’s largest wilderness area from the Wallowa Lake Trailhead near the tiny but artistically mighty town of Joseph. Often called the ‘Alps of Oregon’, the towering snow-capped peaks, pristine glacial lakes, and alpine tranquility ensure the hike of a lifetime for you and your furry companion. 12. 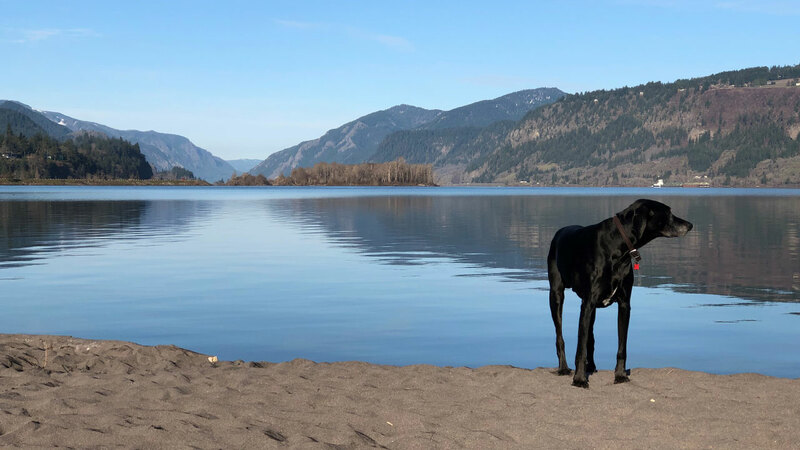 Watch sailboats glide along the Columbia River while your dog romps through waves at the Spit/Sandbar in the town of Hood River. It’s one of the few off-leash waterfront areas and has ample space for a serious game of water-soaked fetch. When traveling with your best furry pal, there are a few basic etiquette tips to ensure a stress-free trip for all: First, book your pet-friendly lodging in advance — we’ve got some tips for that here. Whether you are exploring town or on the trails, make sure to leave no trace. In public and park areas, follow leash regulations to keep your dog, potential wildlife, and delicate plants and flowers safe. And be mindful of travelers your pet encounters; while it’s hard for dog lovers to comprehend, not everyone wants to share their vacation with a four-legged bundle of hair and energy.